Iowa Supreme Court Chief Justice Marsha Ternus. The Iowa Supreme Court’s chief justice today made her first public comments after losing her retention election last month. 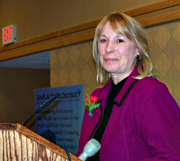 Chief Justice Marsha Ternus and the two other justices who were voted off the court last month issued a written statement on Election Night, but the brief speech Ternus gave during an awards ceremony in Ames was her first public statement in front of microphones and cameras. 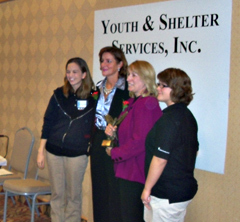 Ternus was recognized by the Youth and Shelter Services organization. The group cited the “one child/one judge” policy Ternus instituted which ensures the same judge deals with a child throughout the entire court system. A 16-year-old who went into foster care at the age of five was there to speak at the awards ceremony and, through her tears, she praised the policy as she’s had the same judge for 11 years. Justic Marsha Ternus and First Lady Mari Culver pose for a picture. Ternus told the crowd her composure had been shattered by the young woman’s tribute. Her last day on the court is December 31. Ternus did not directly mention the retention election, but First Lady Mari Culver — a lawyer — did. Culver was on hand to present the award to Ternus, and she drew repeated bursts of applause from the crowd. Culver called Ternus a “highly-respected leader” and Culver addressed the spectre of future electoral battles for the four justices who remain on the court who joined in the unanimous opinion on gay marriage that sparked voter outrage. Ternus, in her brief remarks, said when she was appointed to the court in 1993 she had no idea her work would include advocacy for children. Ternus said there is “no more important contribution to make” than to help children and families in need. Read a live blog of today’s event.